Hydraulic and Pneumatic Product News | Hose & Fittings, Etc. News About Hydraulic, Pneumatic, and Other Products Provided by Hose & Fittings, etc. You can contact us any time with questions about product additions and updates, obsoleted products and substitutions. To browse available products, please go to our Product Selection Page. Parker’s 285 Series Refrigerant Hose has been tested and qualified to new specifications and standards, including approval of a new refrigerant type. This will be a running change beginning November 1, 2018 – after this date, all 285 hose produced will conform to these standards and carry a new lay line to distinguish them from legacy 285 series hose. The 285 Series has been qualified to both the SAE J2064 Coupled Refrigerant Air Conditioning Hose Assembly Standard (when crimped with 26 Series fittings) and the new SAE J3062 Refrigerant Air Conditioning Hose Standard. It has also been tested to be compatible with new R1234yf refrigerants, in addition to the R134a refrigerants with which it was already rated as compatible. The O.D. 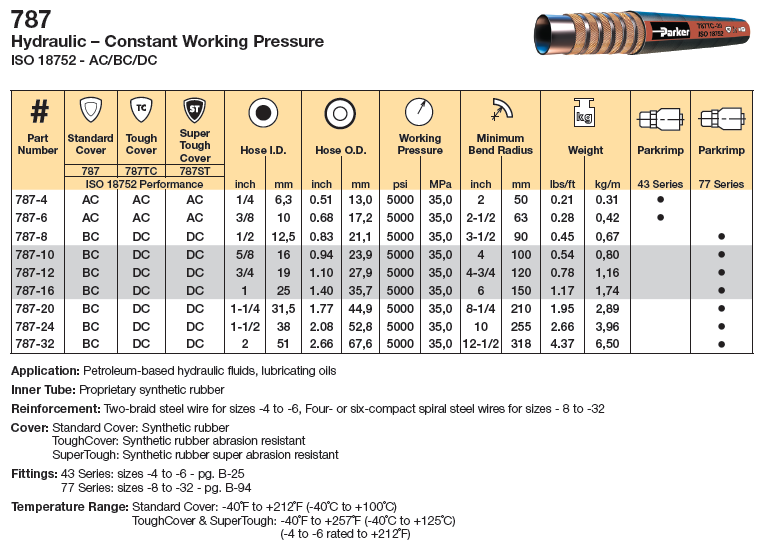 of 285 hose has been reduced from 0.82” (21,1 mm) to 0.765” (19,43), in order to be consistent with the other sizes. This diameter change does not impact the 26 series fitting for -10 size or the hose’s crimp specifications. To help meet demands of high pressure pumping applications for concrete and other abrasive materials, Parker’s SS201 Series Goliath High Pressure Concrete Hose has been upgraded to include new dimensions, sizes and a higher maximum working pressure. These changes will be implemented on a part-by-part basis as current inventory is depleted. SS201 series has expanded by three sizes: 1” ID, 1-1/4” ID and 5” ID. The hose is now rated at 1233 PSI maximum working pressure in accordance with ASME B30.27-2014 (previously ranging between 800 and 1200 psi, depending on hose size). In addition, all existing sizes have new dimensions – please refer to the SS201 Series product page for more information and an updated specifications chart. As of July 2018, Parker has discontinued production of the SS110 Series Medium Duty Multipurpose Hose. This change is occurring as a way to streamline the multipurpose hose product offering. The obsolescence of this hose series affects both standard and non-standard part numbers – all SS110 Series quotations will be expired when current inventories are depleted. Parker recommends the 7311N Series Wildcatter Discharge Hose as a replacement. Please see the tables below for comparative product specifications and part number data. To remedy the duplication in its product line, Parker will discontinue manufacturing several hose series that will be replaced with GlobalCore hose. The first phase of obsolescence occurs on December 31, 2018 – after this date, Parker will no longer fulfill orders containing the discontinued hose series. The second phase occurs on June 28, 2019. For more information, including a table of suggested replacements for each hose series, please see our blog. 9A Series (Standard) and 9M Series (Ultra Flexible) metal hose are now available in sizes up to 6" diameter. ANSI B16.5 flanges are also available in equivalent sizes. 9H Series High Pressure Metal Hose has been obsoleted and will no longer be available for purchase. Parker recommends 9P Series High Pressure Metal Hose, introduced in June 2017, as a replacement. The Industrial and Instrumentation fittings that correspond to these hose series have been consolidated to 7 standard configurations. Additionally, they will only be offered in stainless steel, eliminating the current carbon steel product. For other configurations, fittings will be quoted in stainless steel at 25-50 piece minimum quantity orders only, depending on the desired configuration. As of May 2018, Parker has discontinued production of their Series SS232 Heavy Duty Food Discharge Hose and Series SW431 Flour Hose. When current inventory is depleted this hose will no longer be available for purchase. The discontinuation applies to both standard and non-standard part numbers. Parker does not currently have a suggested replacement hose for these products. Parker has introduced Series 7200LB, a new large bore hydrocarbon drain hose that is designed to quickly evacuate hot, liquefied residue from steam cleaning operations in manufacturing and processing plants and refineries. The high temperature, oil-resistant tube and cover withstands attack by steam vapors and petroleum-based runoff. The hose construction incorporates a static wire as a path to conduct an electrical charge to ground. The vivid blue chloroprene cover is resistant to oil and weathering, and provides color-coded identification. Series 7200LB is qualified with crimp couplings for easy and quick assembly fabrication as well as maintenance-free service. Size Range: 1/4" to 1" 3/16" to 1"
The maximum temperature for Parker's chemical hose with UHMWPE (Ultra-High Molecular Weight Polyethylene) has been reduced from 250°F to 180°F. This change is effective immediately and is a safety measure to avoid misapplications with chemical hose at high temperatures. Hose series affected by this change include: 7373T Blue Thunder, 7374, SWC693, and SWC693B Wildcatter Chemical Hose. At temperatures above 70°F, many chemicals often exceed the performance rating of a hose, even if it is safe with other media above that temperature. The volatility and aggressive nature of these chemicals make it important for the user to test high temperature applications and determine media compatibility to avoid equipment failure or injury. While they are the result of extensive tests and reliable to the best of Parker's knowledge, it is advised that all chemical compatibility charts should be used as a guide only. All critical applications should be tested by the user. Parker's 7308 series hose is now obsolete and will no longer be available for purchase. The series will be consolidated into the 7308E Maxiflex Lightweight Air Hose product line, which is rated to 300 psi maximum working pressure in all sizes. 7308E is a lightweight, flexible medium pressure hose for air, mild chemicals and water applications in the construction, general industrial, quarry and mining industries. The yellow SBR cover is resistant to abrasion and weathering. Please see the chart below for a comparison between the two product lines. 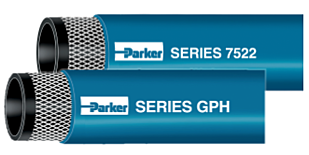 Parker has added a new size (3/8") to the series 7395 E-Z Form™ GS General Service Hose series. Series 7395 now covers a range of sizes from 3/8" to 4" ID. Please see the chart below for the new size's dimensions and specifications. Due to changes in manufacturing methods and processes, Parker's SW360 Dragon Breath® series of hot air hose will have some changed dimensions and construction. The 6" size will now contain a single wire helix, rather than the dual helix construction of the other sizes. Additionally, a new size (1-1/2") has been added. Please see the chart below for all dimensional changes. New dimensions are marked in red. 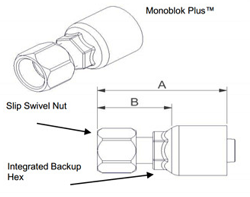 Parker's Fluid Connectors Group has announced a running change for their 10643-16-16 Monoblock™ Plus fittings, which feature a slip swivel nut that accomodates wider wrench flats. 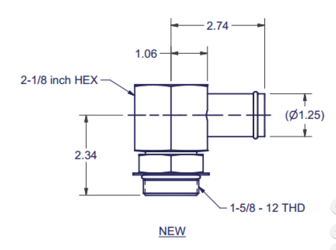 This change will affect the dimensions of the -16 size of the 10643 fittings, as seen in the chart below. Product shipped with these new dimensions will have a yellow label affixed to their box. Parker's Fluid Systems Division has introduced a running change beginning in February 2018 for their PLP Composite Plug-In Y fittings, which will be introduced through a stock rotation. The brass insert cap is being replaced with a plastic wall as part of the injection mold process. This change will improve flow through the fittings. 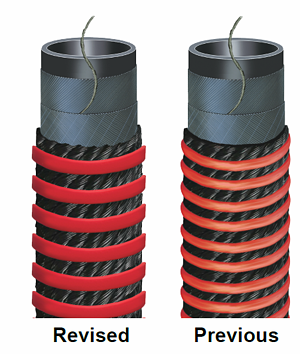 Parker's Parflex division has announced a new resin approved for use in the manufacturing of their Hybrid 2.0 and TOUGHJACKET™ hose. The addition of this new copolyester inner tube material will allow Parker to insure a stable supply of product for customers. Hose series affected by this change include D6R, HFSR, HFS2R, HR1CR, HR2CR, HTBR, 560TJ, 563TJ, 590TJ and 594TJ. Hoses that are made with this material will meet the same specifications that can be found in the current 4660 catalog and will not change in form or function. This change will begin in November 2017 and is expected to be fully implemented in 2018. 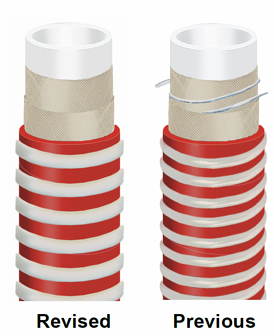 Parker Hannifin Industrial Hose Division has announced an update to Series SP330 Light-N-Bright Corrugated Food Suction Hose's construction, profile, dimensions, size range and performance criteria. Size range from 1-1/2" to 4 ID"
Size Range 1-1/2" to 4" 2" to 4"
* For currently qualified crimp and coupling specificationsn refer to CrimpSource at www.safehose.com. 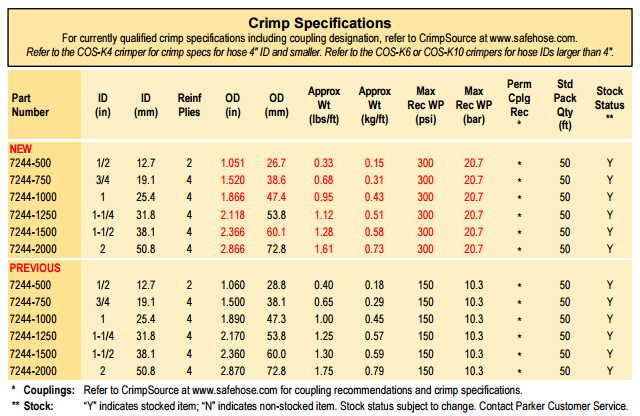 Refer to the COS-K4 crimper for crimp specs for hose 4" ID and smaller. Refer to the COS-K6 or COS-K10 crimpers for hose IDs larger than 4". 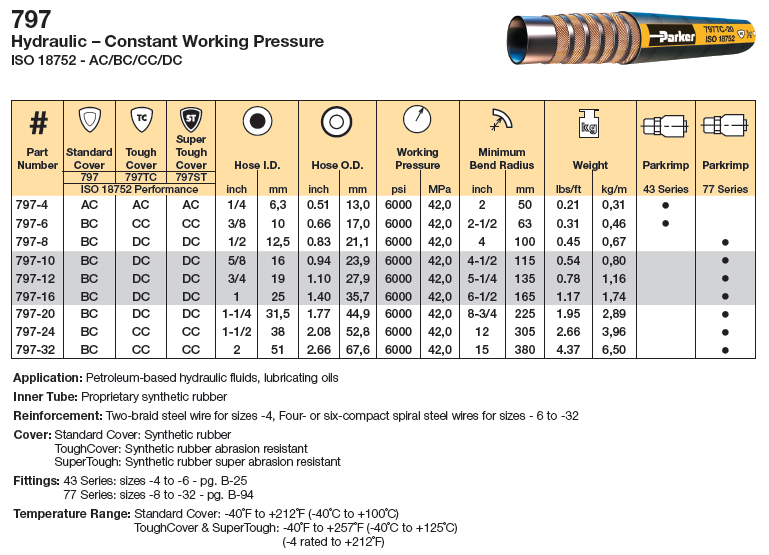 Parker Hannifin Industrial Hose Division has announced the discontinuance of Series 7236 & SS123 to streamline the concrete placement/high pressure abrasive material handling. The discontinuation is being implemented on a part number by part number basis as current inventory is depleted. It applies to both standard and non-standard part numbers within the respective product lines and all quotations will be expired with the discontinuations. Parker offers upgraded Series SS201 Goliath High Pressure Concrete, Grout and Plaster Placement Hose as the suggested replacement. Parker Hannifin Industrial Hose Division has announced updates to Series SS201 Goliath High Pressure Concrete, Grout and Plaster Placement Hose. To meet the increasing demands of high pressure pumping applications for concrete and other abrasive materials, new production of SS201 is now rated 1233 PSI maximum working pressure in all catalog sizes. The upgrade is being implemented on a part number by part number basis as current inventory is depleted. Parker Hannifin Industrial Hose Division is announcing the obsolescence of the SP100 and XSP100 PVC Bulk Coils effective immediately. The changes in status apply to Series SP and Series XSP standard and non-standard part numbers within the respective product lines on a part by part basis until inventory is depleted. All quotations will be expired. There are no suggested replacements. Parker Hannifin Industrial Hose Division has announced effective immediately that Series 7543 Nitrile/PVC Lay Flat Oil Resistant Hose and Series 7544 Polyurethane Lay Flat Oil Resistant Hose are now obsolete. The changes in status apply to all standard and non-standard part numbers within the product lines. Size Range 1-1/2" to 6" 2" to 6"
Parker Hannifin Pneumatic Division is announcing the obsolescence of the SPF & SPN Flow Controls Valves Series. This is a product the PDN purchases from the Parker Hydraulic Valve Division. The HVD has chosen to obsolete these product series from their offerings. Parker Hannifin Pneumatic Division is announcing the obsolescence of the PL50 Injection Lubricator as it has become impractical to produce. Items below with a grey background and blue font were obsolete June 1st, 2015 and the balance of the product will be considered obsolete on October 15th, 2017. Orders for Kits will be accepted until October 16th, 2017 or until stock is depleted. Parker Hannifin Industrial Hose Division has announced that it will discontinue Series SS155 medium duty water discharge hose when inventory is depleted, on a part-by-part basis. The discontinuation applies to both standard and nonstandard part numbers within the product line, and all quotations will be expired with the discontinuation. Please use Series 7306H hose as a suggested replacement. New CNG hose is available from Parker Parflex division: CNGRP series hose is engineered for regulated pressure natural gas and features electrically conductive construction. It is standard in 5/8" ID but production of other sizes may be possible for large quantities. 77 Series are now available in stainless steel. 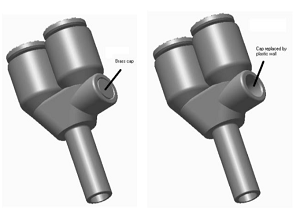 Dimensions of some elbow fittings (sizes -20 through -32) have changed. As of time of writing, the most current catalog available from parker does not reflect these changes. Give us your name and email if you would like to receive an updated PDF Catalog 4400 once it is available. Until the catalog is available, you may download the document listing the dimensional changes and Catalog 4400 Addendum. Parker Hannifin Industrial Hose Division announced that to meet the increasing demands of high pressure sand blast systems, new production of Parker Series 7244 Sand Blast Hose is now rated to 300 PSI maximum working pressure in all catalog sizes. The upgrade is being implemented on a part-number-by-part-number basis, as current inventory is depleted. If you are using 7244 hose in an application requiring working pressure more than 150 PSI (the current rating), check production date on your hose's layline to make sure that it is manufactured after February 2017. Series 7244 is designed to blast sand and other abrasive materials to clean, condition or strip cement, steel, stone and other materials in a variety of applications. The thick, static dissipating natural rubber tube provides abrasion resistance and a heavy wall provides durability and kink resistance. The blended rubber cover is resistant to abrasion and weathering. Series 7244 is available in 200-foot continuous lengths, subject to minimum order quantity and quoted pricing. See below for the updated specs. Effective January 16, 2017, Parker’s 575X-8 hose will be discontinued and replaced with their new 575XN-8 hose. This hose is constructed with a nylon jacket that offers increased abrasion resistance and a wider range of chemical compatibility. It will use the CG permanent fitting series. The crimp die needed for this hose will not change with this replacement. The 80C-P08 crimp dies that were approved for the 575X-8 hose with 55 series fittings are also approved for the CG series. While the 55 and 58 series fittings are being discontinued by Parker, the 575XN-8 is approved for use with these fittings. This allows customers to use current inventory while they transition to the CG series. As of January 2017, Parker’s Tube Fittings Division will be implementing a running change in the swivel nut design for female Triple-Lok swivel fittings. 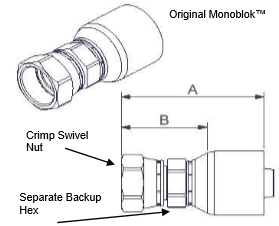 For all fittings of this type that are sizes -16 and above, an improved and more reliable lock wire design (Figure 2) will replace the current crimped-on swivel nut (Figure 1). This change will improve the sealing characteristics of Parker’s larger-sized stainless steel fittings. The new design will continue to meet SAE J514 requirements and will not affect the form, fit or functionality of the product. Effective with new production, the cover color for Series SW373 hose is changing from yellow to blue. This change aligns with popular/customary hose color-coding in the chemical, food and beverage, and sanitary processing industries. There will be no changes to the performance capabilities or the dimensions of the product. Classification of select food and beverage hose has moved from the 3-A hose assembly standard to the 3-A recognized hose assembly component standard. This change is effective immediately. Concurrent with this update, Parker will no longer offer food and beverage factory hose assemblies. However, 3-A factory hose assemblies previously supplied by Parker meet 3-A requirements. Parker's Food & Beverage hose offerings are being consolidated to simplify and streamline inventory. Consequently, the following products will be discontinued when current inventories are depleted. Refer to Catalog 4800 or our website pages for additional product descriptions, dimensions and specifications. 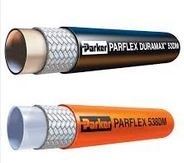 Parker has qualified additional equipment for manufacturing 575X-12 Parflex hose. This change results in an increase in the hose I.D. shown below. The crimp diameter and performance of this product will not be affected by this change. As shown above, however, there is a change to the required Parkrimp crimp die. This change to the Parkrimp crimp dies is effective immediately for all 575-12 hose. 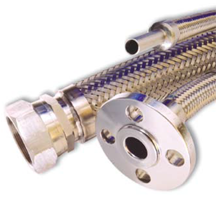 Please see the 575X Series Parflex Hose page on our website for updated specifications. An Air Saver is a pneumatic valve that converts a continuous air blow to a pulsed air blow without the need for any other external control. Air is blown with a series of ON and OFF pulses. 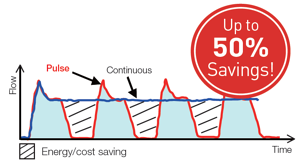 When the blow is OFF, there is no air consumption, resulting in reducing of compressed air consumption by up to 50%. This technology works in open end blow applications but not in actuating applications like powering pneumatic cylinders. Any process that requires blow of air to clean, dry agitate or move parts is a potential candidate for savings. Even processes using hand held nozzles can benefit by using the HASV08R Air Saver. Parker's Hose Product Division announced the addition of -4 and -6 sizes to their 787 and 797 GlobalCore hose offering. -4 and -6 sizes are compatible with 43 series fittings, enabling you to take advantage of the full range of 43 series configuration and existing crimping solutions. 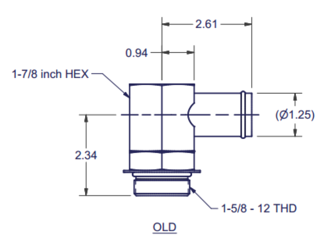 The sizes -8 through -32 require 77 series fittings. Download the Catalog Addendum for 787 and 797 hoses. Beginning August 1, 2016, the Parflex part numbers 1120-2A, 1120-2.5, 1120-3A and 1120-5A will no longer be using the 1120 designation. Instead, the part numbers will begin with “PFT,” which is the original designation that is still used by many truck and trailer OEMs. Please see the chart below for examples of how to order these sizes. Beginning in June 2016, Parker is adding new material sources for fiber-reinforced hydraulic hoses in their Parflex division. These sources will strengthen the supply chain without changing the form or functionality of the product. Hose series that will be affected by this change include the 510A, 510B and 510C series, the 53DM/538DM series, and the 540N series. Please see the image below for a more complete list of the hoses that will be using the new approved sources. The 25TB-20-20 is a Parker male SAE straight thread (with O-Ring) 90˚ Elbow fitting. Parker will start shipping fittings with new dimensions starting May 2016. The new design offers a more robust hex with wider wrench flats. The design change for the 25TB-20-20 increases the size slightly; see below. This will be a running change, with Parker shipping the old style fittings until the inventory is depleted. As a result, Hose & Fittings, Etc. inventory may be mixed. Please contact us with any questions. Some of the biggest challenges for designing battery operated, handheld medical devices are size, weight and battery life. All three can be significantly improved by using Parker's new LX Series miniature solenoid poppet valve. The Series LX-Valve is a miniature latching pneumatic solenoid valve measuring only 8 mm in width. The compact size, light weight, and power saving latching feature of the Series LX-Valve is the ideal solution for portable/battery powered applications. The body construction of the Series LX-Valve is suited for manifold or barbed-tube pneumatic connections and is available in a 2 way configuration. Reduces power consumption and heat generation. Typical applications are air & oxygen delivery. The 2440N-08V32-TC ultra-high pressure water jetting hose is now available with a tougher, WJTA-compliant nylon cover. Parker’s 2440N hose provides service for the construction and shipbuilding industries, along with general industrial cleaning applications that require high-pressure water jetting. The 2440N Series hose excels at hydrodemolition and removing accumulated dirt and other materials from concrete and asphalt. The previous version of this hose (2440N-08V30) was constructed with a black polyamide cover, with the blue Tough Cover only available through size -05. The addition of a TC option means that the -08 size is now compliant with the water blast industry’s recommended blue outer jacket color, with the addition of increased abrasion resistance and toughness. The minimum bend radius for this hose size remains the same, at 200 mm, with a ½” I.D. and 22.5 mm O.D. Parker’s 53DM/538DM DuraMax™ low-temperature hydraulic hose is an excellent choice for construction and agriculture in cold climates, refrigeration, cold storage and other industries where equipment is regularly exposed to freezing temperatures. The low coefficient of friction and high abrasion resistance in the original, matte copolyester cover has made 53DM/538DM ideal for a variety of applications, including over-the-sheave for lift trucks. It also has a superior bend radius (when compared to SAE J517 and 100R18), and smaller O.D. than 100R7 and 100R18. The 538DM hose is non-conductive, meeting SAE J517 standards. While the original cover was already rugged enough to withstand some of the most extreme low-temperature conditions, Parker has made further improvements with a new thermoplastic elastomeric jacket for the 53DM/538DM. This new cover not only looks different – the matte copolymer has been replaced with a glossy thermoplastic material – it also works harder for you. Previously, the temperature rating for 53DM/538DM ranged from -40° F to 212° F. With the new jacket, these hoses can withstand up to -70° F in flash freeze conditions. Additionally, abrasion resistance has increased by 20-30%, and the coefficient of friction has been lowered by approximately 80%. The end result is a highly durable and resilient low-temp hose. Parker has introduced a new compact ball valve, the XV501PCHP-4. This rugged valve offers superior performance and durability, withstanding the pressures, high temperatures and chemicals in the carpet and steam cleaning industry. When compared to other compact ball valves, the XV501PCHP-4 results in fewer leaks and reduced incidences of equipment failure and downtime. The XV501PCHP is constructed with an all-brass body that resists corrosion and degradation, with PTFE seats/seals and stem packing. The handle and nut is made with plated steel. This design can handle higher pressure and temperatures when compared to similar valves like the MV608 series. Parker has announced a manufacturing change for two 43-series fittings. Part numbers 10643-12-12 and 10643-16-16 (female JIC swivels, 3/4" and 1” size, respectively) will be manufactured as Monoblok™ Plus parts. 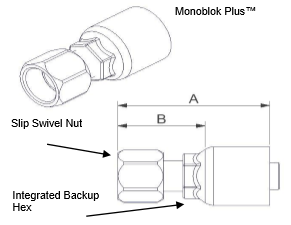 The introduction of Parker’s 43 Series Monoblok™ Plus fitting began in 2004 with 45° and 90° elbows, and has since been expanded to include straight fittings. This is going to be a running change so Parker will ship both styles until the old stock is depleted. The slip swivel nut is more robust than the crimped nut and features wider wrench flats. Integrated back-up hex offers an easy way to keep hose from twisting during installation. A horizontal part number is easier to read before and after the fitting is crimped. The Parker Tube Fittings Division (TFD) is pleased to introduce a new hand deburring tool as part of our tube fabrication equipment product line. The deburring tool (Part Number 226B) will replace the recently obsoleted deburring tool (Part Number 226A), effective immediately. The 226B deburring tool incorporates a rubberized grip surface to improve its effectiveness and makes it easier for the end user to properly deburr steel, stainless steel, copper and aluminum tubing prior to tube end fabrication. 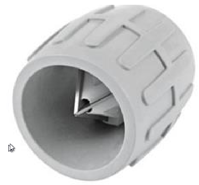 It can be used to deburr both the inside and the outside of a tube end from outside diameter sizes 1/8” to 1-1/2”. 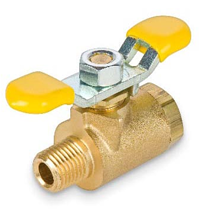 The price for the 226B is the same as the obsoleted 226A ($29.23), and is available to order from Hose & Fittings, Etc. Today Parker Parflex Division announced the availability of two new hoses: 563TJ and 594TJ. The 563TJ hose meets the performance requirements of SAE 100R17 and the 594TJ hose meets the performance requirements of SAE 100R19. Both hoses are MSHA accepted. 563TJ and 594TJ are available in twin-line and multi-line bonded constructions for improved hose assembly management by limiting movement, preventing tangling and rubbing. Bonded hose assemblies create a compact system for smooth operation. Both hoses also feature the new TOUGHJACKET™ abrasion resistant cover. Parflex introduced the TOUGHJACKET™ cover in October of 2015 specifically to meet the demands of large-scale, heavy duty applications found on construction and ag equipment. It provides exceptional abrasion, weather, oil and flame resistance. Parflex has offered both 1035A and 1035HT hoses for the carpet cleaning industry for a number of years. Over time, however, users have migrated to the 1035HT hose due to higher temperature demands of current systems. The 1035HT hose should be used to replace 1035A hose. It offers a higher temperature rating of 230°F (vs. 212°F for 1035A hose) and a higher pressure rating of 1,750 psi in all sizes (vs. 1,500 psi for 1035A-4 hose, and 1,200 psi for 1035A-6 hose). 1035HT hose is also available in 3/16” ID (1035A is only available in 1/4” and 3/8”). 1035HT hose has also been qualified for use with the new 56 series fittings, where 1035A still requires the 55 series fittings. 55-series and 58-series fittings are being replaced by the 56-series – read the blog about 56 series fittings replacing 55 series and 58 series fittings if you use either one of those. Parker Hannifin's Parflex Division has announced that a new PVC (Polyvinyl Chloride) resin material will be added to the manufacturing process for their PV Series of clear vinyl tubing. The new resin introduction is Parker's effort to bolster the supply base and will be a running change beginning in February 2016. The resin for the PV-Series is formulated for superior purity, clarity and flexibility, as well as FDA compliance for materials in contact with food or drugs for human consumption. The vinyl tubing’s clarity makes it a great choice for low-pressure sight flow gauges, allowing operators to view the media moving through the tubing. Its flexibility allows for soft, easy handling and bending without collapsing the tube during installation and usage. Please contact us on this page with your inquiries, or email us at hfe@hfeweb.com. Parflex Division/Fluid Connector Group/Marketing-Sales Dept. Parker's SCOUT Mobile software is now available on Android! The software is available as a free download on the iOS and Google Play app stores. Android mobile users can now get the same great features for their SensoNODE sensor monitoring systems - comprehensive diagnostic data, user-defined alerts, real-time trends and more! 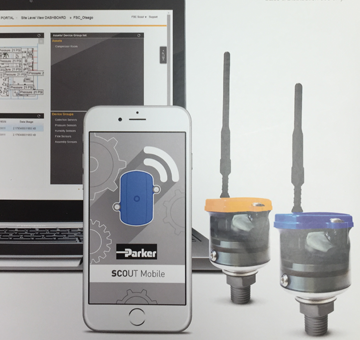 Parker's SensoNODE Blue and SnesoNODE Gold are wireless monitoring systems for hydraulic and pneumatic systems. SensoNODE Blue enables maintenance personnel to monitor pressure, temperature, and humidity remotely, using their smart phone or tablet devices. SensoNODE Gold enables maintenance personnel to remotely monitor flow and power in addition to pressure, temperature and humidity.It is engineered to work with Parker Transair industrial air distribution piping but can be used on any shop air piping. For more information, check out our blog about the SensoNODE™ wireless monitoring system.